Irish Crystal vase is an 5" tall footed bulb design that is cut by Galway in the Longford pattern. This Irish crystal vase is a small footed bulb design that is cut in the Longford motif. The Longford vase features a cut design that extends all around; it stands 5" tall. The Galway Crystal vase is made of 24% leaded crystal; it is gift boxed, complements of The Irish Gift House. Irish Crystal vase is an 8" tall bud design that is cut by Galway in the Longford pattern. Irish Crystal vase is a 4" tall bulb design that is cut by Galway in the Longford pattern. Irish Crystal vase is a 4" tall waisted design that is cut by Galway in the Longford pattern. 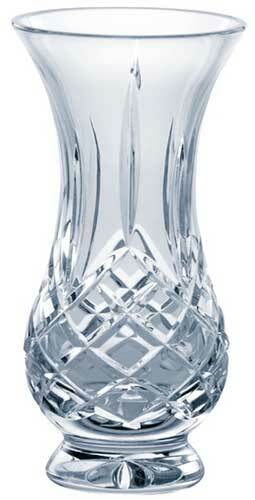 Irish Crystal vase is a 5" tall waisted design that is cut by Galway in the Longford pattern.